Do you want to replace the old medieval weapons with weapons of the 21st century? In this case, you can do this for a couple of minutes without installing different third-party programs and you will not have lags in the end. 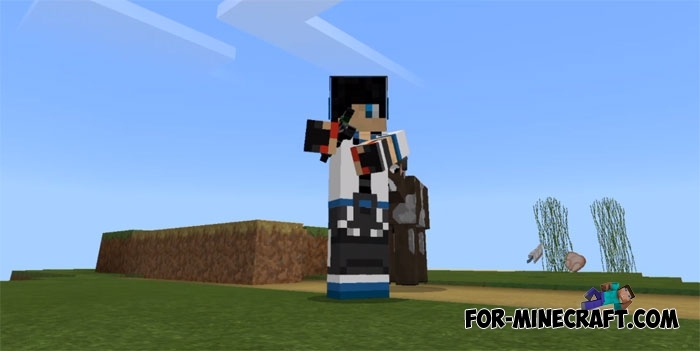 The New Weapons addon replaces the original swords, bows and other dangerous items with modern weapons that are more comfortable and cause more damage. There are 8 new types of weapons and also potions, use this set to defend or attack opponents. How to get the new weapon? The addon simply replaces the standard weapons so open a crafting table and craft new weapons using old recipes. At your disposal are a rifle, several knives, a grenade and a mini nuclear bomb even. The operating principles of the weapon has not changed so for example you need to set fire to a nuclear bomb so that it explodes, but the explosion power is increased 5 times.